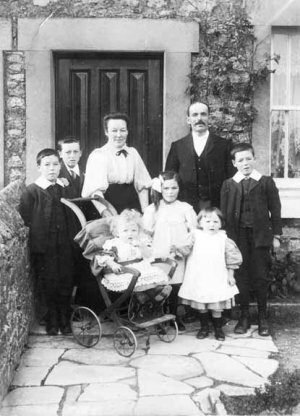 "....The SLACK family when living at Water Lane, Middleton: Left: William (c 23 Sep 1898), Charles (c 2 Mar 1894), Mary Rose (nee BROOKS c 29 Sep 1870), John SLACK (c 2 Mar 1870), Herbert (c 30 Sep 1896), John (Jack) in pushchair (born 1908), Florence (c 29 Apr 1903), Doris. Charles, the eldest, became a train driver and went to live in Oldham, where he married and had one daughter: she still lives there. Herbert lived in Middleton, married and had one daughter who still lives in Derbyshire. She is married with a family. William fought in WW1 and returned to Middleton a much-changed person from the comic who had left the village; he never spoke about his experiences in France. He was engaged, but quarreled with his fiancee and neither ever married. He lived in Hall House with the family and worked at Masson Mill and later in the train works in Derby. When his sister Doris married and moved to Bolsover, in 1948, he moved to Skegness to live with his sister Florence and her family. During WW2 Doris delivered the post in Middleton and looked after her father, John SLACK,until he died in 1944. Mary Rose SLACK died 21 Nov 1932. Florence also worked at Masson Mill and described how she and her friends used to walk over the fields to get there and how,during the winter, the girls used to walk in the footprints left in the snow by the boys. She met her husband when she ran into him on her bicycle outside Middleton Post Office. When they married she went to live in Bolsover. She had one daughter. Jack married and had one daughter; they lived in Bolehill, before moving to Matlock. His daughter married and lives in Derbyshire near her family. My mother told the story that when DH Lawrence lived with Frieda in the cottage along the road past their house the children were told to run away from him. (This is used in Lady Chatterley's Lover). Lawrence used a shop in the village owned by one of her Uncles (Peter?) and the tale went that Lawrence offered Peter a copy of Lady Chatterley, which he refused! I used to visit Hall House when very young. My memories are very hazy, but I do remember the gleaming floors and the black leaded fireplace with its oven. There was no electricity and the ground floor rooms were lit with oil lamps and candles were used upstairs. I have a slightly squashed finger caused by the front gate swinging back and trapping my finger between it and the wall. The family also owned or rented a field above the village where the odd cow and pigs were kept. They also grew a lot of their own vegetables and were pretty self-sufficient. I remember going on a picnic in Via Gellia (I called it my Jelly Wood apparently) and also seeing it carpeted with bluebells. Magical! As a child I always knew if visitors to our home were from Middleton by the way they pronounced "to". My mother was never happier than when talking to her sister Doris or other relatives (and there were lots of them!) about the people in Middleton they remembered from their childhood. In 1989 I visited Midddleton and found Hall House divided up into several smaller dwellings. One was empty and across the lane at the front of the house was an outhouse which still had the shallow stone sink that had been there when I was a small child. The offending gate was also still the same. It was during this visit that I was told that in a few weeks' time there was to be a concert in the Methodist Church where my mother got married, and I managed to take her to this. She also went to see a cousin, Alice Southam(?) then. This was the last time she saw to her beloved Middleton.